Your transport will drop you off at the Mangatepopo Road end. The first section of the track is fairly flat, well formed and board walked in damp areas to provide stability under foot. Marker poles line the track. 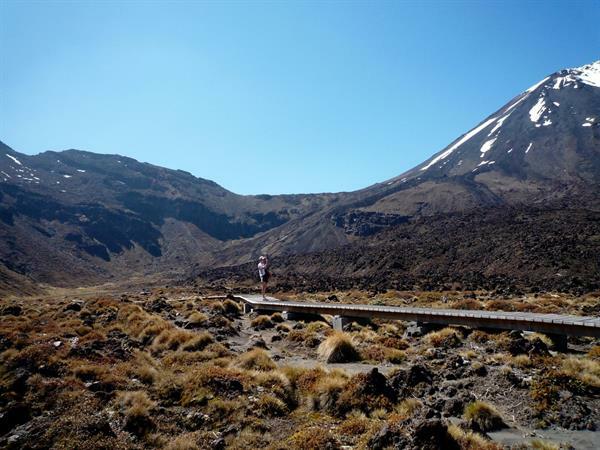 About 15 minutes in from the start, the track to Whakapapa branches off to the right. A further five minutes on from this junction, another sidetrack leads left towards the Mangatepopo Hut and public toilet facilities. The main track however, continues up the valley, following the Mangatepopo Stream and around the edge of an old lava flow. As the altitude increases, walkers will notice a change in plant species along the track. The last toilet facilities are located at Soda Springs; there are no further facilities until you reach the Ketetahi shelter.